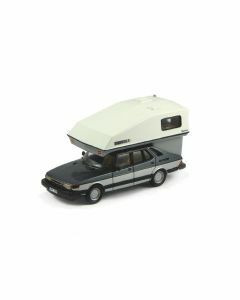 Toppola is a brand of camper shell originally made for the Saab 99 combi coupé. By removing the hatch and putting on the Toppola a car could be converted to a campervan in about 15 to 30 minutes. It is also just as easy to lift the top off and reattach the hatch door and use the car without the Toppola. Even if the unit looks small it features full standing height (2.0 m) and a 170 by 200 cm bed. It could be fitted with a complete kitchen and even a heater for use during winter. The total weight addition is about 115 kg, so the unit is very light. The Toppola was first made for the Saab 99, but later also Saab 900, Saab 900 (NG), Saab 9000, Saab 9-3 and Ford Sierra and Scorpio. Production has stopped in 2006 and SCANDO was looking for someone to take over production of the Toppola. Two versions of Toppola camper were produced by Griffin Models in June 2012, followed by famous DreamTrip Toppola, build by Griffin Models in 2013. 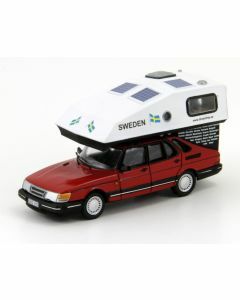 "IntSaab 2012 Limited Edition Toppola" is limited to only 25 kits.